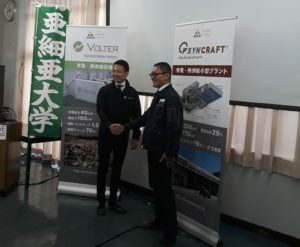 Volter is proud to announce a new sales collaboration in the Japanese renewable energy market to boost sales of Volter Japan and Forest Energy. On 17th November 2018 Volter Japan and Forest Energy Inc. announced a new collaboration that will strengthen both parties in the Japanese renewable energy market. A new jointly held company Volter Japan KK will focus on sales of Volter systems in Japan while Volter Akita KK will focus on technical services and customer support as the old core team of Volter Japan. The new sales team will focus on sales of Forest Energy bioenergy solutions combining Volter CHP systems with Austrian made Syncraft power plants and biomass supply networks. “Forest Energy has an excellent business model focusing not only on product sales but offering a solution tranforming not only the Japanese distributed energy lanscape but also bringing about social and environmental development in the local communities. This fits perfectly with the Volter bioenergy business and offers even better growth opportunities in Japan for both parties” comments Antti Lilleberg, Director of Sales and Marketing for Volter. The collaboration will provide Volter with a better sales coverage of the complete Japanese market as well as the well known Forest Energy brand.